1. An element X has two in the ratio 1:3. The relative atomic mass of x would be __. 2. 200cm3 of oxygen diffuse through a porous plug in 50 seconds. How long, will 80cm3 of methane (CH4) take to diffuse through the same porous plug under the same conditions? 3. Which of the following terms indicates the number of bonds that can be formed by an atom? 4. The diagram above represents an atom of __. 5. Which of the following gases is the most dangerous pollutant? 6. A Side effect or Soft water is that __. D. it encourages the growth of bacteria. 7. Farmlands affected by crude oil spillage can be decontaminated by __. D. burning off the oil from the area. 8. Which of the following functional groups will give gas bubbles when treated with a saturated solution of sodium hydrogen trioxocarbonate(iv)? 9. The oxidation state of Cr in K2Cr2O7 is __. 10. 2Na2O2(s) + 2H2O(l) → 4Na0H(s) +O2. The substance that is oxidized in the reaction above is __. Z in diagram above represents __. 13. Which of the following does NOT happen when a Zinc rod is introduced into a solution of Copper(II)sulphate? D. The blue colour of the solution gradually disappears. 14. Which of the following statements is correct during the electrolysis of a caustic soda solution using platinum electrodes? D. Alkalinity at the cathode increases. 15. Which of the following statements is INCORRECT? 16. The iron(iii)oxide impurity in bauxite can be removed by __. 18. Which of the following compounds gives a yellow residue when heated and also reacts with aqueous sodium hydroxide to give a white gelatinous precipitate soluble in excess sodium hydroxide solution? 19. The least easily oxidized of the metals below is __. 20.Which of the following chlorides would exhibit the least ionic character? 21. 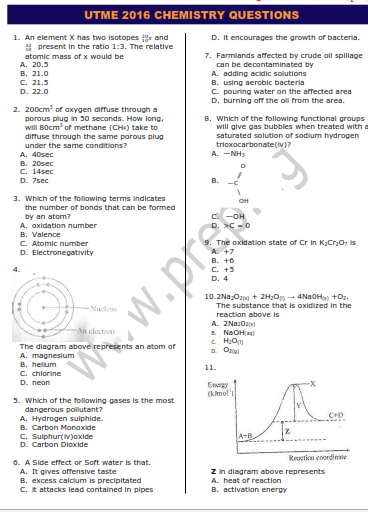 Which of the following CANNOT be obtained by fractional distillation of petroleum? 22. Which of the following is used as an anti-knock in automobile engines? 23. The Avogadro number of 24g of magnesium is the same as that of __. D. 35.5g of chlorine molecules. 24. In an electrolyte set-up to protect iron from corrosion, the iron is __. 25. The removal of rust from iron by treatment with tetraoxosulphate (vi) acid is based on the __. D. dehydration of the iron. 26. The substance often used for vulcanization of rubber is __. 27. Metals of the first transition series have special properties which are different from those of groups I and II elements because they have partially filled. 28. A particle that contains 11 protons, 12 neutrons and 10 electrons is probably a __. 29. A catalyst increases the rate of a chemical reaction by providing a path that __. 30. A metal M displaces Zinc from ZnCl2 solution. This shows that __. D. Zinc is more electropositive than M.
31. Calculate the quantity of electricity in coulombs required to liberate 10g of copper from a copper compound. 32. The IUPAC names for the compounds CH3COOH and CH2 = CH2 are respectively __. 33. The boiling point of water is higher than that of methanol because __. 34. If an element x of atomic number Z and mass number y is irradiated by an intense concentration of neutrons, the relevant nuclear equation is __. 36. An element with atomic number twelve is likely to be __. A. electrovalent with a valency of 1. B. electrovalent with a valency of 2. C. covalent with a valency of 2. D. covalent with valency of 4. 37. Which of the following physical properties decreases across the periodic Table? 38. If a gas occupies a container of volume 146cm3 at 18⁰c and 0.971 atm, its volume in cm3 at s.t.p is __. 39. 50cm3 of carbon(ii)oxide was exploded with 150cm3 of air containing 20% oxygen by volume, which of the reactants was in excess? 40. The formula CH2O for ethanoic acid is regarded as its __.